Bombs are, sadly, not unusual in Baghdad. But when a car packed with explosives detonated in the busy Mansour district this week, killing at least 10 people and injuring 27, something very unusual happened. 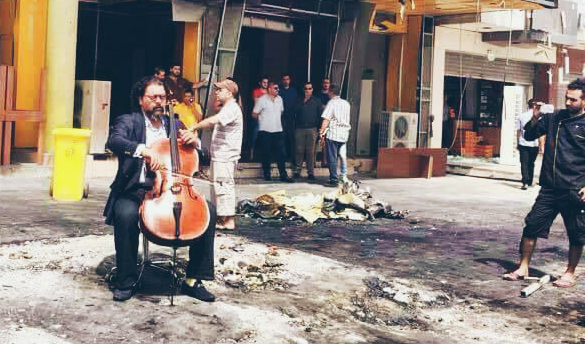 Karim Wasfi, the renowned conductor of the Iraqi National Symphony Orchestra, turned up as soldiers and police secured the area. He took out his cello, sat down on a chair, and started to play. Images and video clips of the man some simply call „maestro“ quickly went viral, not only on Iraqi social media, but further afield. Wasfi spoke to Al Jazeera about his decision to play the instrument, about why music and culture are as important as food and water, and about why the Middle East should be living in peace. Al Jazeera: Some people say that, at a time of war, music and culture are an indulgence, that people need to concentrate on more basic necessities. Wasfi: An absolutely false statement. I think this is rubbish. At this stage, it is needed as much as food, as much as oxygen, as much as water. I do understand the reality behind the argument of basic services and basic needs. I think this is as basic as electricity and water. Maybe I’m being as extreme as the other side is. Al Jazeera: Why is culture and music as basic a need as food and water? Wasfi: Because it refines and cultivates. Because it inspires people. Because it develops better brains. Because it helps you with maths and physics. Because it helps you with fine arts and painting. Because it makes kids well-behaved. Because it has enough discipline to make you creative as an engineer or as a physician or as an army officer. Because it has a positive impact on the psychology of mankind. Because you can breath better. Because you can think better and clearer. Because you can find more talent within yourself. And, before all that, it’s an international language of mutual understanding. It’s everything. To read the full interview please got to Al Jazeera.